Those who are using Facebook for the very first time may definitely seek some help in account creation, profile organization as well as in photo updates. Timeline of a new facebook user often appears empty but you can try to fill it up soon. But before that it is important to design your profile in such a manner that everyone will find it eye catching and unique. To do this, we recommend you to update stunning profile photo with impressive Facebook cover. The article below will help you to get detailed information about how Facebook Cover Photo can be uploaded for the very first time as well as about how to change it. Some of the most important attractions of a Facebook profile use to be profile photo and cover photo. The cover photo use to be of larger size and it appears above your profile photo. In order to create special impact on viewers, always prefer to update unique cover image for your Facebook profile and in case if you are running a business page then you have to stay more careful. You might be aware of the fact that Facebook Cover photos have definite size and users can upload changes according to that settings only. The general dimensions for a Facebook cover photo use to be 315 pixel for height and almost 851 pixels for width. If your cover photo is not having same dimensions then you may have to crop it. To do this, simply move to an editor tool like Photoshop and then import your cover photo over there. Now choose the crop tool and update its resolution as 315 pixels for height and 851 pixels for width. Once you are done with desired editing then get your image saved to your device. Prefer .jpg file format for Facebook covers. Step 1: Go to your profile and move to the already updated cover photo. Here you will find Update Cover Photo option out of four different choices: Choose from Photos, Upload Photo, Reposition, and Remove. Step 2: Now click “Choose from My Photos” option to select a cover photo for your profile. This method can help you to select photos from your already uploaded Facebook photos. Step 3: You can choose your cover photo from your favourite album that is always available on Facebook platform. Once you have updated your desired photo then you can soon view it from timeline but it will be containing one message over it: “Drag to reposition cover”. In case if your cover is not of standard size then you will have to adjust its dimensions on Facbeook. Note that Facebook covers need to be wider enough to meet its dimensions, the minimum requirement of the cover photo is 720 pixels wide. Step 4: It is time to drag your cover photo with the simple to use auto drag tool of Facebook. Try to adjust your cover photo perfectly within the standard frame size. Note: In case if you are not satisfied with the quality or content of your recently updated Facebook cover photo, you can try to update another one with the same procedure as discussed above. It is also possible to select photos from any folder inside your computer or smartphone. When you choose to select from your computer then it will immediately open up a new navigation window on your screen and you will be able to see all files through it. Simply follow the instructions displayed on screen to select your photo. As soon as you have changed your cover photo with any of these methods as discussed above, it will soon appear in your timeline posts. 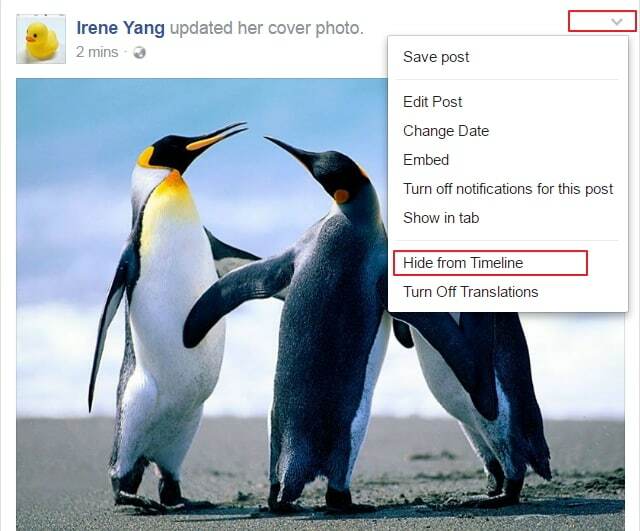 In case if you want to remove it from news feed, you can also make settings to remove the cover page change notification from timeline. On the right hand corner of your cover, you will find a pencil like icon, click this one to hide your cover notification from the page.